Dhanani School of Science and Engineering (DSSE) at Habib University invites renowned professionals and academics to share their ideas on a wide variety of interesting subjects through its Public Lecture Series. The series aims to enlighten, motivate and stimulate academic debate. Each event is tailored for the general public and encourages participants to think across academic disciplines. The SSE Public Lecture Series is open and free to attend for the general public. It is hosted at Habib University’s City Campus. 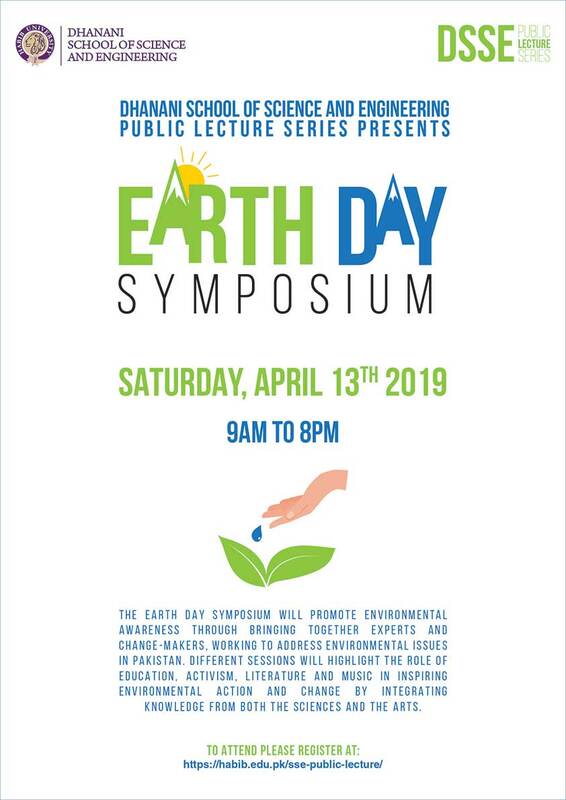 The Earth Day Symposium will function as a platform to promote environmental awareness through bringing together experts and change-makers who are working to address environmental issues in Pakistan with their work in the fields of journalism, policy-making, architecture and academia. Along with integrating knowledge from both the sciences and the arts, the sessions will also highlight the role of education, activism, literature and the performing arts in inspiring environmental change and mobilizing communities capable of widespread change. Poetry reached its pinnacle with the thirteenth century Sufi called Jalaluddin Rumi. 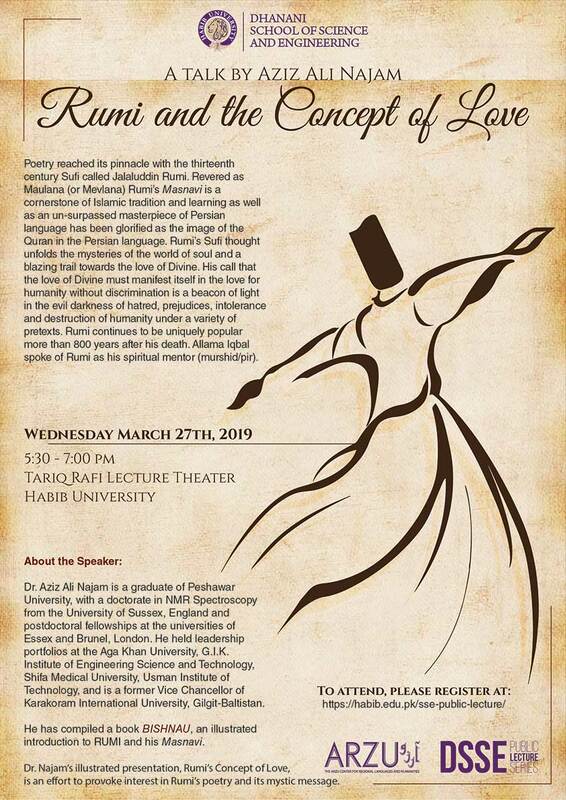 Revered as Maulana (or Mevlana) Rumi’s Masnavi is a cornerstone of Islamic tradition and learning as well as an un-surpassed masterpiece of Persian language. has been glorified as the image of the Quran in the Persian language. Rumi’s Sufi thought unfold the mysteries of the world of soul and a blazing trail towards the love of Divine. His call that the love of Divine must manifest itself in the love for humanity without discrimination is a beacon of light in the evil darkness of hatred, prejudices, intolerance and destruction of humanity under a variety of pretexts. Rumi continues to be uniquely popular more than 800 years after his death. Allama Iqbal spoke of Rumi as his spiritual mentor (murshad/ pir). Dr. Aziz Ali Najam is a graduate of Peshawar University, with a doctorate in NMR Spectroscopy from the University of Sussex, England and postdoctoral fellowships at the universities of Essex and Brunel, London. He held leadership portfolios at the Aga Khan University, G.I.K. Institute of Engineering Science and Technology, Shifa Medical University, Usman Institute of Technology, and is a former Vice Chancellor of Karakoram International University, Gilgit-Baltistan. He has compiled a book “BISHNAU”, an illustrated introduction to RUMI and his Masnavi. HOW MIGHT TECHNOLOGY FACILITATE THE CREATION OF A BLUEPRINT FOR SUSTAINABLE HOUSING? Often mistaken as a luxury, access to housing along with electricity, water, sanitation, and hygiene is an essential human right. In the modern era, housing technology has the potential to offer a more sustainable and environment-friendly form of living. Yet a sizeable population finds even basic housing facilities inaccessible in the under-developing world. 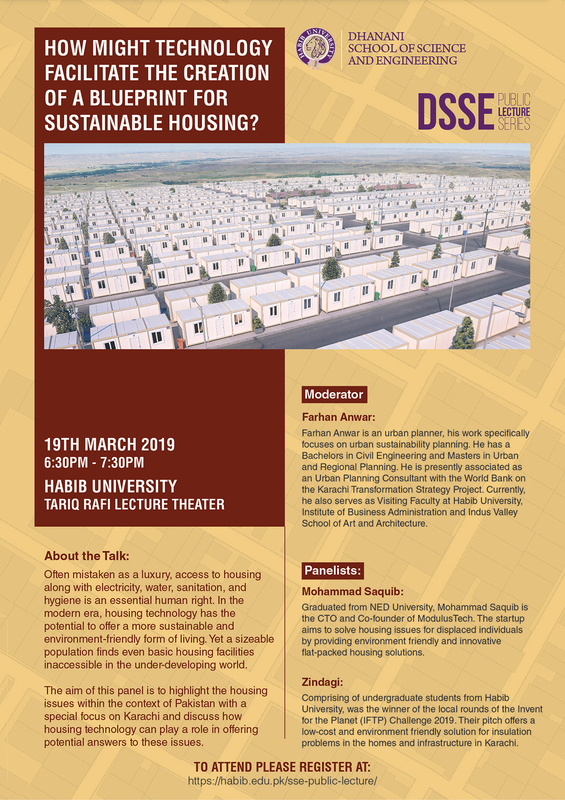 The aim of this panel is to highlight the housing issues within the context of Pakistan with a special focus on Karachi and discuss how housing technology can play a role in offering potential answers to these issues. Graduated from NED University, Mohammad Saquib is the CTO and Co-founder of ModulusTech. The startup aims to solve housing issues for displaced individuals by providing environment friendly and innovative flat-packed housing solutions. Zindagi, comprising of undergraduate students from Habib University, was the winner of the local rounds of the Invent for the Planet (IFTP) Challenge 2019. Their pitch offers a low-cost and environmentally friendly solution for insulation problems in the homes and infrastructure in Karachi. Farhan Anwar is an urban planner, his work specifically focuses on urban sustainability planning. He has a Bachelors in Civil Engineering and Masters in Urban and Regional Planning. He is presently associated as an Urban Planning Consultant with the World Bank on the Karachi Transformation Strategy Project. Currently, he also serves as Visiting Faculty at Habib University, Institute of Business Administration and Indus Valley School of Art and Architecture. Skyrocketing growth in the technology sector has resulted in a pressing need for improvements in the computing content present within national curricula. In this talk, Saquib will present his experience in designing and implementing computing curriculum in public and private middle schools. This work was done in cooperation with school teachers, education professionals, and the Ministry of Education. Saquib Razak is an Associate Teaching Professor of Computer Science at Carnegie Mellon University in Qatar. He has a Ph.D. in Computer Science from State University of New York, Binghamton and a BS and an MS degrees from University of Texas, Austin. Saquib also worked as an Embedded Software Engineer at Motorola Inc. for eight years. DEMYSTIFYING THE UNIVERSE; How Far We Have Come And Where Are We Headed To? The observations of the oldest light, Cosmic Microwave Background (CMB), by the Planck Satellite have confirmed that the Universe we live in is flat, largely dominated by dark component of matter and energy (~97%). Yet our understanding is incomplete! We still struggle with the concepts like dark matter, dark energy, cosmic inflation. This talk will describe about 13.6-billion year’s history of the cosmos according to what we know and how current and future experiments in cosmology can provide us much more information about the fundamental laws of the universe. Muntazir Abidi is a PhD student at the Stephen Hawking Centre for Theoretical Cosmology, University of Cambridge, working with Dr. Tobias Baldauf and Dr. Blake Sherwin. He completed a Masters of Advanced Study in Applied Mathematics in 2015 from the University of Cambridge, a postgraduate diploma in high energy physics from the Abdus Salam International Centre for Theoretical Physics (Trieste, Italy) in 2013 and a BS in Physics from LUMS in 2012. 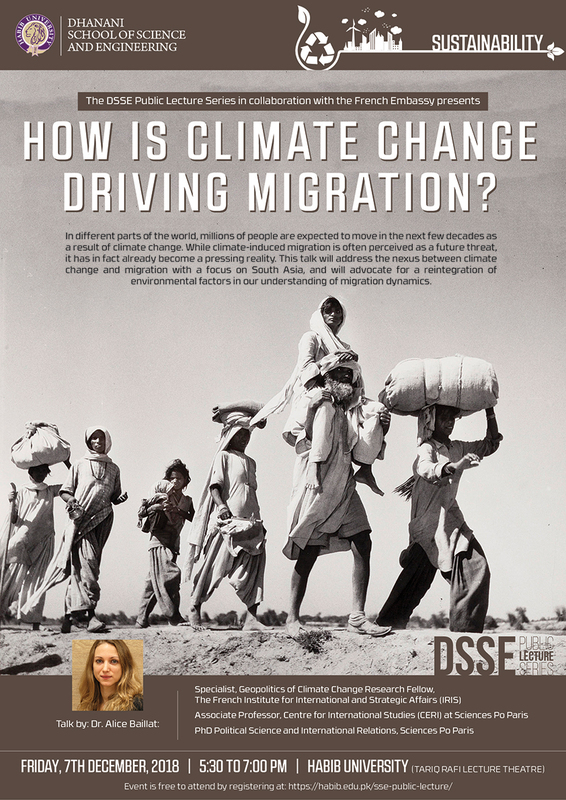 The DSSE Public Lecture Series in collaboration with the French Embassy presents a public lecture on: How is climate change driving migration? In different parts of the world, millions of people are expected to move in the next few decades as a result of climate change. While climate-induced migration is often perceived as a future threat, it has in fact already become a pressing reality. This talk will address the nexus between climate change and migration with a focus on South Asia, and will advocate for a reintegration of environmental factors in our understanding of migration dynamics. The DSSE Public Lecture Series in collaboration with the Italian Consulate presents, Symposium on Astronomy - a shared global heritage. Join us for an exciting series of events to explore how the Science of Astronomy connects us all as one race regardless of religion, race, or culture on a pale blue dot in the cosmos. This symposium seeks to emphasize the sense of commonality in the global culture of Astronomy. The symposium is planned to culminate with a Grand Panel on which Astronomy experts from different domains will present individual aspects of one shared heritage. The world of science is a rapidly changing one. Biology, a fundamental branch, is developing at an exponential pace and becoming an engineering discipline which 'builds' and 'invents'. The foundational technologies to drive this trend are to be known along with the implications it will have on our health, food, and environment. We also need to know what is enabling biology to merge software, hardware and 'wetware', and how it catalyzes inspiration and expression through art and design. Peshawar has already produced traction in the area of synthetic biology but how did we manage to do it there and what areas remain to be worked on? Dr. Faisal Khan, an award-winning biologist and an entrepreneur, has been the Founding Director of the Institute of Integrative Biosciences at CECOS University, Peshawar where he now leads pioneering work as an Assistant Professor, including the SynBioKP project which supported the award-winning IGEM Peshawar teams of 2016 and 2017, and the NCBC Precision Medicine Lab. Dr Khan holds a Masters in Integrative Bioscience and a Doctorate in Systems Biology from the University of Oxford, where he also went to the business school to study Strategy and Innovation. He also leads Peshawar 2.0, a social enterprise that has been engineering the startup ecosystem in Peshawar. Faisal has also been advising the Government as a member of several Boards and Advisory Committees on Science and Technology, IT, Startups and Education. He is currently transitioning towards building a biotech company out of Peshawar at the intersection of software, hardware and wetware. This lecture will provide an overview of various emerging wireless standards for low power IoT applications and the main focus will be circuits and systems design consideration for Bluetooth Low Energy (BLE) radios. It will present on the emerging low power receivers and discuss two-point PLL modulation, power management, and circuit impairment. It will also introduce a process technology called Fully Depleted Silicon-On-Insulator (FD-SOI) and its unique features that can be exploited in design of analog, mixed-signal, and RF circuits. M.S. and Ph.D Electrical Engineering, UT Dallas. Senior Research Fellow, University College Dublin. RFIC Design Engineer, Cypress Semiconductor Corp.
Group Member of Technical Staff, Texas Instruments. Visual Effects (VFX) is one of the most visible applications of mathematics. Production houses increasingly need artists and scientists who rigorously work together to create super-realistic visuals. These artists and scientists aim to see and explain the universe in different and innovative ways whether it is a cinematic sensation of an explosion in space such as in Armageddon and Star Wars or the depiction of realistic cloth and hair in Final Fantasy and Frozen and the synergic collaboration between artists and scientists continually defy physical laws and create impressive visuals for us. In this presentation, the two disciplines will discuss how the partnership of two seemingly different minds has positively affected the entertainment industry and how they have synthesized the world of computer graphics positively. Dr. Majeed is interested in conducting research and teaching computational mechanics, geometric modelling, and high performance computing. His PhD thesis was on Isogeometric analysis using manifolds and immersed method under the supervision of Dr. Fehmi Cirak. He graduated with a first class degree in Aerospace Engineering from the University of Sheffield in 2010. Since completing his undergraduate, he has worked for a number of companies including AgustaWestland, Romax Technology and Walt Disney Animation Studios. Before joining HU as an Assistant Professor for Computer Science, he was a software engineer at Bloomberg L.P.
Jawwad’s expertise include investment management, product development and risk models. Within the startup community his interest lies at the intersection of online education, financial services, empowering the special needs education community, impact and transformative investments and teaching computer science to middle school children. He was part of the core team that launched the P@SHA Startup Insider series, P@SHA Launch Pad, P@SHA Social Innovation Fund as well as the P@SHA’s the Nest I/O Incubation initiative in Pakistan. The four initiatives together over the last decade helped change the face of the startup landscape in Pakistan. WHY SHOULD YOU BECOME A GAME DEVELOPER? Sadia has organised multiple international events & games jam in Pakistan. She has been doing workshops & Training programs around Pakistan and has been invited as a speaker at various events. 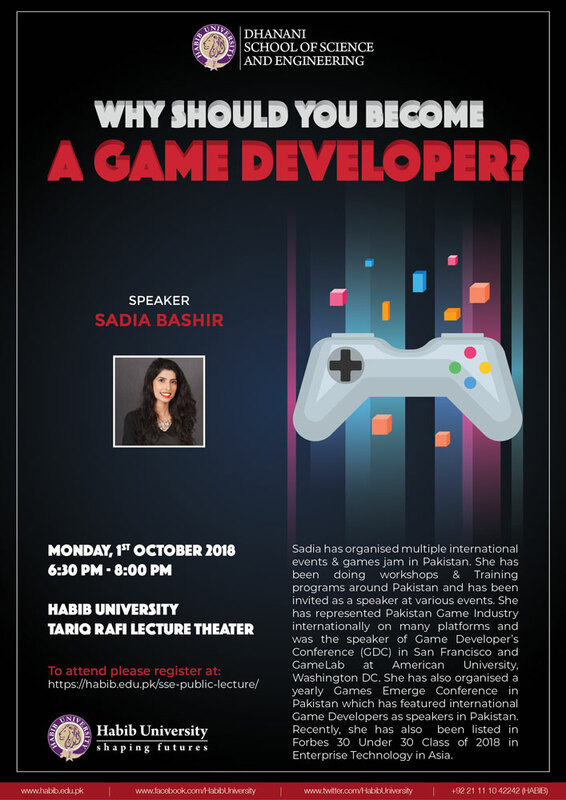 She has represented Pakistan Game Industry internationally on many platforms and was the speaker of Game Developer’s Conference (GDC) in San Francisco and GameLab at American University, Washington DC. She has also organised a yearly Games Emerge Conference in Pakistan which has featured international Game Developers as speakers in Pakistan. Recently, she has also been listed in Forbes 30 Under 30 Class of 2018 in Enterprise Technology in Asia. The trigonometry we learned in high school is a mere shadow, the part that is needed to do calculus, of this beautiful and ancient discipline. Beginning in ancient Greece to resolve astronomical needs, trigonometry began not on the flat surface we are accustomed to, but on the celestial sphere. On this new surface the theory changes; the results are always elegant and often surprising. The subject developed through several cultures, especially medieval India and Islam, finding uses in a variety of contexts including the determination of the direction of Mecca and ocean-going navigation. We shall explore the beauty and power of spherical trigonometry through its theory, its history, and its diverse applications. 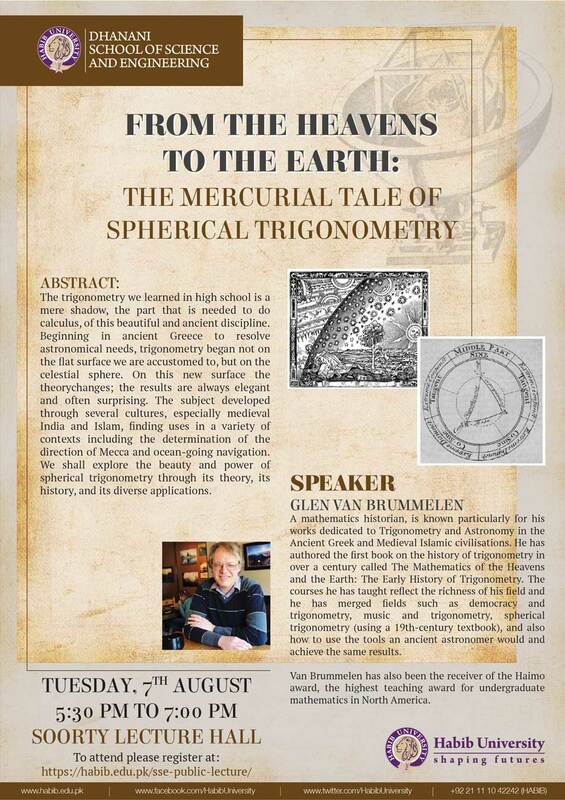 Glen Van Brummelen A mathematics historian, is known particularly for his works dedicated to Trigonometry and Astronomy in the Ancient Greek and Medieval Islamic civilisations. He has authored the first book on the history of trigonometry in over a century called The Mathematics of the Heavens and the Earth: The Early History of Trigonometry. The courses he has taught reflect the richness of his field and he has merged fields such as democracy and trigonometry, music and trigonometry, spherical trigonometry (using a 19th-century textbook), and also how to use the tools an ancient astronomer would and achieve the same results. Van Brummelen has also been the receiver of the Haimo award, the highest teaching award for undergraduate mathematics in North America. 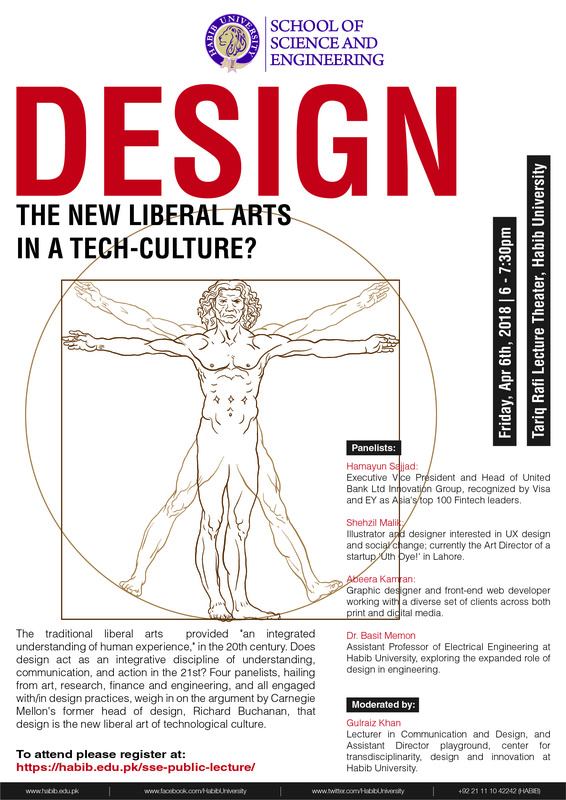 DESIGN: THE NEW LIBERAL ARTS IN A TECH-CULTURE? The traditional liberal arts provided "an integrated understanding of human experience," in the 20th century. Does design act as an integrative discipline of understanding, communication, and action in the 21st? Four panelists, hailing from art, research, finance and engineering, and all engaged with/in design practices, weigh in on the argument by Carnegie Mellon's former head of design, Richard Buchanan, that design is the new liberal art of technological culture. Hamayun Sajjad: Executive Vice President and Head of United Bank Ltd Innovation Group, recognized by Visa and EY as Asia's top 100 Fintech leaders. Shehzil Malik: Illustrator and designer interested in UX design and social change; currently the Art Director of a startup 'Uth Oye!' in Lahore. Abeera Kamran: Graphic designer and front-end web developer working with a diverse set of clients across both print and digital media. Dr. Basit Memon: Assistant Professor of Electrical Engineering at Habib University, exploring the expanded role of design in engineering. Gulraiz Khan: Lecturer in Communication and Design, and Assistant Director playground, center for transdisciplinarity, design and innovation at Habib University. As we step in the age of AI, the question of ethics remains hanging in the middle. How will mankind deal with this conflict (if there is any?) between Artificial Intelligence and Human Intellect while also dealing with the moral and ethical domains of mankind's existence. This SSE Public Lecture invites the mind to think and question these issues and ponder upon what could be the most important question of our time as we stand on the cusp of a new era of human-designed intelligence, which could possibly outpace its creators. Dr. Sajjad Haider: Dr. Haider heads the AI lab at IBA. His areas of research include applications of Artificial Intelligence in robotics, finance, risk management, and strategy development. 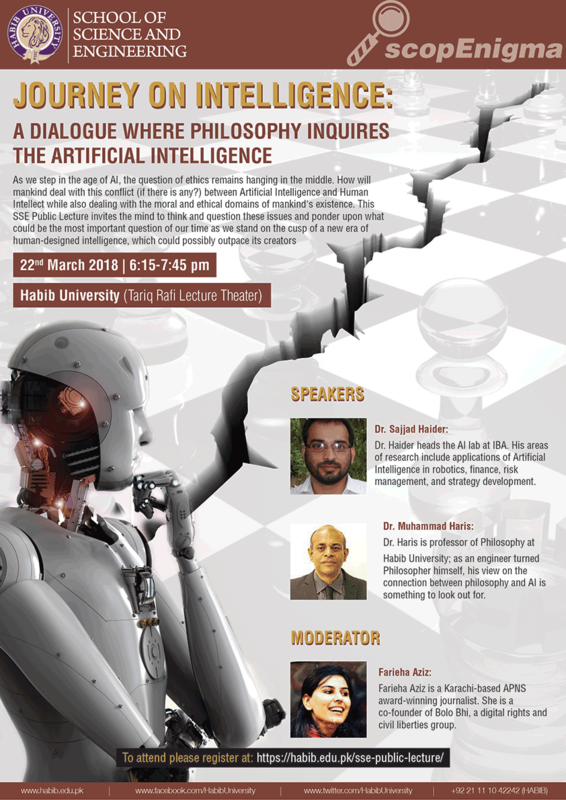 Dr. Muhammad Haris: Dr. Haris is professor of Philosophy at Habib University; as an engineer turned Philosopher himself, his view on the connection between philosophy and AI is something to look out for. Farieha Aziz: Farieha Aziz is a Karachi-based APNS award-winning journalist. She is a co-founder of Bolo Bhi, a digital rights and civil liberties group. 7th March, 2018 10:00 AM - 11:30 AM Introductory lecture on the general history of astronomy in medieval Islamic civilization. 7th March, 2018 11:30 AM - 12:30 PM Snacks and tea break. 7th March, 2018 12:30 - 2:00 PM Workshop on the standard astrolabe (general audience). Each participant in the workshop will receive a model of an astrolabe which is based on the astrolabe by al-Khujandi (fourth century Hijra) which is now in Doha, Qatar. All participants will then solve exercises by themselves, under our guidance - so the workshop will hopefully bring some real insight in the workings of the instrument. 7th March, 2018 2:00 PM - 3:00 PM Lunch. 7th March, 2018 3:00 PM - 3:30 PM Possible discussion and home exercises given to the participant. 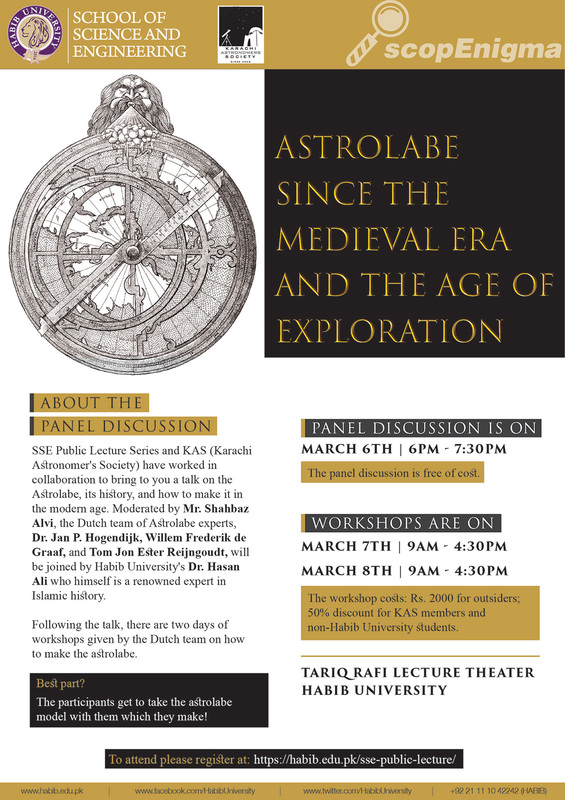 8th March, 2018 10:00 AM - 11:00 AM Introductory lecture on astrolabes in medieval Islamic civilization. 8th March, 2018 11:30 AM - 12:30 PM Snacks and tea break. 8th March, 2018 12:30 - 2:00 PM Workshop. The participants will learn the abjad numerical system, and use this to decipher and analyze historically important astrolabes; including the Khujandi astrolabe (fourth century Hijra) and several astrolabes made in Lahore which are now in the Western world. We will use photos of these astrolabes. 8th March, 2018 2:00 PM - 3:00 PM Lunch. 8th March, 2018 3:00 PM - 3:40 PM One-hour workshop on the astrolabe which was developed by Ahmad ibn Muhammad al-Sijzi (fourth century H.). This special astrolabe is based on the theory of a rotating earth. This workshop will be conducted by Mr. de Graaf who has a special interest in the topic, with assistance from Mr. Reijngoudt. Suleman Shahid is working as an Assistant Professor in Computer Science in LUMS university, where he directs the ‘Computer Human Interaction and Social Experience Lab. His research interests include mobile apps and VR/AR systems to enhance the quality of life of persons with disabilities and older adults and educational technologies for children. More recently he has become interested in ‘information and communication technologies for development where he takes a multidisciplinary approach for designing interventions in the areas of education and health. Since 2009, he has been offering consultancy and training services in the areas of design thinking and user experience (UX) design and strategy. In antiquity, human illness was considered a curse, work of demons and treatments and cures were mostly magic, witchcraft, sacrifice and gods were involved. Hippocrates laid the foundations of rational medicine 400 years BCE. His teachings were carried on further by Galen, and then by the physicians in the Islamic Golden age, lasting for almost 2000 years. But the practice of medicine through these years was based on the theories of four elements and the four humors, not based on science. Renaissance began in the 14th century in Italy, mostly in art, sculptor, architecture and mathematics, and other fields of study. Renaissance in medicine began almost 250 years later in Padua, Italy and it took another 350 years of progress in spurts, for medicine to be based on scientific study of anatomy, physiology, pathology, physical examination, microbial disease and much more. Progress in surgery was still later and truly began in the 17th and 18th centuries. Even though the first successful heart operation was performed by Ludwig Rehn in 1896, it took many more related and unrelated developments before heart surgery became routine in the period between 1955-1960. 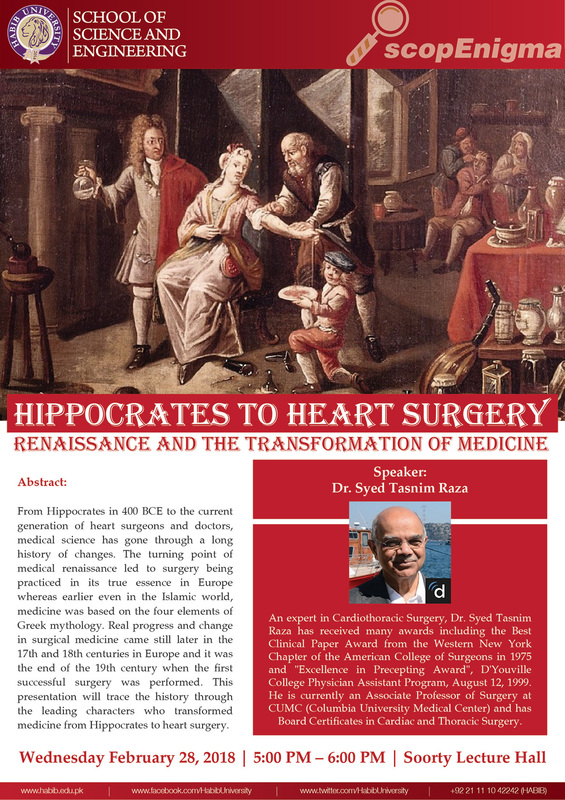 This presentation will trace the history through the leading characters who transformed medicine from Hippocrates to heart surgery. A Rhodes Scholar from Pakistan, Dr. Sabieh did his M.Phil from the Department of Physics at Oxford University. He currently teaches at LUMS and has a wide range of interests , including but not limited to the link between Islamic history, philosophy, and science. He writes in English and Urdu and is a highly published writer in this regard as well as research in his own fields. About the talk: The internationally acclaimed pioneers of the Formula Electric Racing Car makers in Pakistan will be engaging with car aficionados in discussion about making their dream car. About the talk: In the Neo-Tech-Age, Silicon Valley derives its hub status by acting as a melting pot for the best talent, mentorship and funding for innovative ideas. Creating such a fertile and self-reinforcing eco-system for entrepreneurship is arguably a difficult task and replicating it in other parts of the world presents its own unique challenges. Is it a natural phenomenon particular to that region? Or is it the result of a culture that has persistently experimented with investments in cutting-edge technology? Answering these questions can provide clues on contextualizing such a culture for the Pakistani startup landscape, which is already located in the heart of a past-times hub i.e. Indus Valley. About the talk: Zartaj will talk about the renewed focus on STEM Education that is critical to equipping Pakistani youth with STEM skills. She will elucidate the significance of STEM skills extending beyond STEM occupations. STEM knowledge is now determined as the foundation for a balanced program of learning and teachers’ capacity building is pivotal to the implementation of this cross-disciplinary approach of teaching STEM. Zartaj Waseem, a STEM Educational professional and software engineer, is currently the head of Robotics and STEM Studio at Haque Academy. She is very passionate about STEM education and wants the Pakistani youth to gain more hands-on experience. As a result she co-founded the Robotics Labs. Serving as a mentor for IBA’s Center of Entrepreneurial Development, she is an advisory member of RoboKids Pakistan, Tech Tree and has previously served as a Global STEM Corps Advisor for virtual mentoring of the Tanzanian team. Do we need to make our Cyber-Connections more secure than before? About the talk: Shahmeer Amir will be giving a talk at Habib University about cyber security and its importance in a world so dependent on the Internet. His talk aims to raise awareness of the level of risk that companies, governments, and the common people are at when they are surfing the Internet or even just sharing data through it. Although Shahmeer’s educational background is in Electrical Engineering, he has a very impressive list of achievements to his name in a very different field. He has helped resolve some very critical software issues for companies like Facebook, Microsoft, Yahoo, and Twitter. He was ranked 3rd Most Accomplished Bug Hunter Worldwide and has also established a company, Veiliux, which aims to make the Internet safer to use for all. About the talk: Social entrepreneurship in Pakistan is still an unexplored arena. With thriving nonprofit organizations working for social causes, it is difficult for social startups to establish themselves in the ecosystem. However, to bring civic innovation in gestating entrepreneurial ecosystems like Pakistan's, it is extremely important that social startups are sustainable. The speaker will focus on Pakistan's role in the global tech market, social entrepreneurship in the region, how innovation affects the civic society and the importance of self-sustainability of a social start up. Muhammad Waqas is the co-founder and CEO of a technology start-up Wonder Tree. His venture is all about creating social impact. Wondertree is using augmented reality for the therapy and education of children with special needs. His idea recently won an award hosted by Shell Tameer. At The GIST 2016 held at Silicon Valley, Wondertree secured third spot competing along 1072 global startups. With a long list of representations made locally and abroad, the startup has won numerous awards including P@SHA Awards 2016 in Pakistan and APICTA (Asia Pacific ICT Alliance) Awards 2016 held in Taipei. Is Going Solar the Only Answer to Pakistan’s Energy Crisis? About the talk: The demand for electricity has seen an exponential growth in Pakistan even when it has a sizable population that has never been connected to the electricity grid. Pakistan's energy infrastructure is ill-prepared for expansion and reliant on non-renewable sources. This discussion intends to explore how we can intelligently manage demand for people connected to the grid through energy efficiency and complement the rest by growing the “off-grid solar” sector to sustainably solve the country's perennial energy crisis. Jeremy is the co-founder and COO of EcoEnergy, where he works to provide solar energy solutions to the 70 million people that lack access to the electricity grid. Although his background is in software development in Australia, he has spent the past 10 years building and growing social impact organisations and businesses, such as AIESEC, NOWPDP and now EcoEnergy. Nida R. Farid is an aerospace engineer and renewable energy consultant, with a rich experience in both fields from North America and Europe. She recently co-authored the Integrated Energy Plan for Pakistan, heading the Energy Flow Diagram, Energy Efficiency and Renewable Energy Chapters. Her projects include energyefficiencydatabase.com, energy efficiency awareness campaigns, as well as energy audits for commercial and industrial customers. She has an SB in Aerospace Engineering from MIT and an MS in Mechanical Engineering from ETH Zurich, specializing in aircraft engines and gas turbines. About the talk: Rapid progress and frequent disruptive developments make it hard to predict the future of computing. However, some extrapolations can be made from observing current trends. This talk will present how developments like the projected end of Moore’s law, the rebooting computing initiative, quantum, biological and neuromorphic computing at one end and the exploitation of cloud-based computing, edge/ fog computing, and the power of IoT at the other end are expected to expand computing to new horizons. 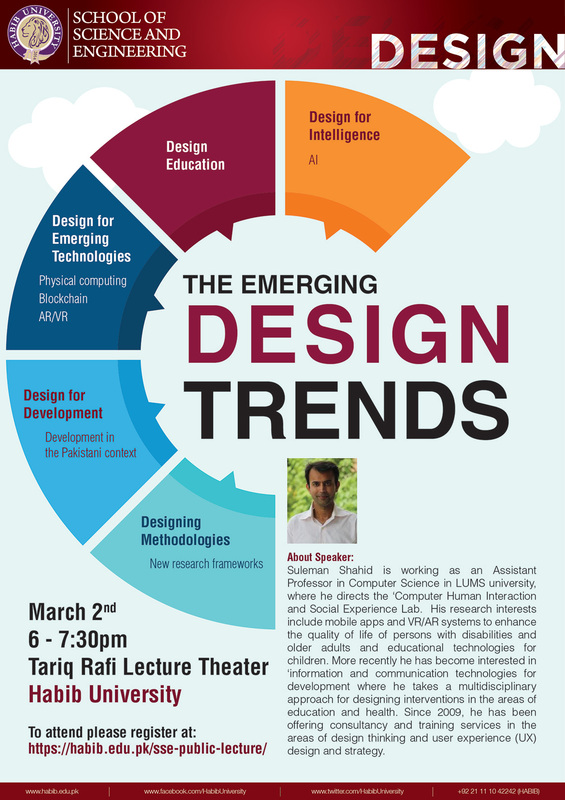 The role of architectural enhancements in shaping the future face of computing shall also be discussed. And we will see how, in the midst of these revolutionary changes, the role played by women in STEM needs to be redefined and rigorously pursued. About the speaker Dr. Hasina Khatoon has over 28 years of teaching experience at both graduate and undergraduate levels at NED University of Engineering and Technology (NED-UET) and at National University of Computer and Emerging Sciences (FAST-NU) at whose Karachi campus she currently also serves as Director. Her major areas of interest include High Performance Computing with special emphasis on new and emerging architectures including multicore processors. Other areas of teaching and research include Distributed systems, Microprocessor based system design, Parallel Computer Architecture, Operating Systems and Parallel Processing as a problem solving paradigm. She completed her BE (Electronics) from NED UET and went on to acquire Postgraduate Diploma in Electronics Design Engineering from Philips International Institute of Technological Studies, Holland. She was awarded Quaid-e-Azam Scholarship by virtue of her first position at NEDUET which she utilized to complete her MSEE from Stanford University, USA. She later completed her PhD from NEDUET in Computer Engineering with emphasis on High Performance Computing. About the talk: Keeping track of the sky was vital for ascertaining the seasons before the invention of calendars and clocks. Different civilizations over the course of history have kept track of movements of celestial bodies and recorded several supernovae and comets, signifying their obsession with the heavens above. The talk will focus on various aspects and techniques in Astronomy. The speaker will give an overview of the sky and how to navigate it with the help of stars in absence of compass and other instruments and many other astronomy related topics. 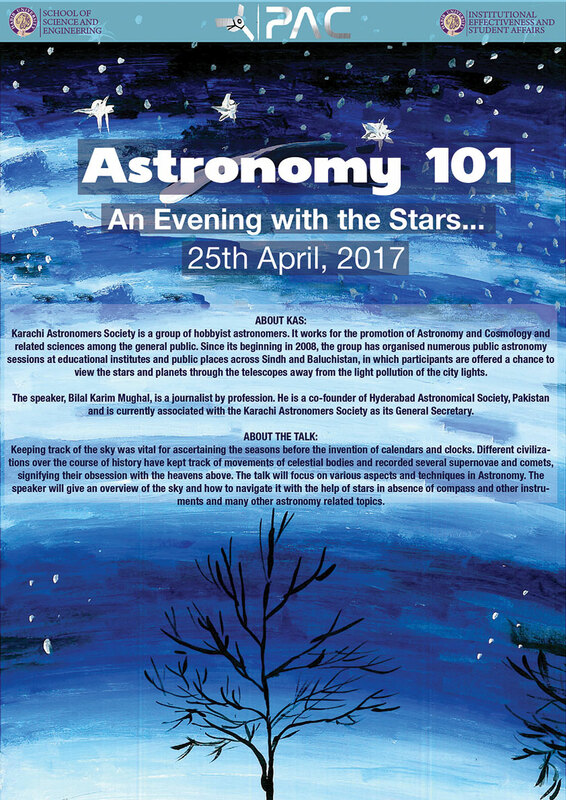 About Karachi Astronomers Society (KAS):: Karachi Astronomers Society is a group of hobbyist astronomers. It works for the promotion of Astronomy and Cosmology and related sciences among the general public. Since its beginning in 2008, the group has organized numerous public astronomy sessions at educational institutes and public places across Sindh and Baluchistan, in which participants are offered a chance to view the stars and planets through the telescopes away from the light pollution of the city lights. The speaker, Bilal Karim Mughal, is a journalist by profession. He is a co-founder of Hyderabad Astronomical Society, Pakistan and is currently associated with the Karachi Astronomers Society as its General Secretary. About the talk: The practice of the healing arts has evolved from invoking magic and supernatural spirits in the earliest civilisations to the scientific clinical method of the modern age. The latter involves obtaining a history of the presenting complaints to frame a hypothesis of the disease followed by a physical examination and investigations to test the predictions of the hypothesis. In this illustrated presentation, we detail two instances from the histories of Vincent van Gogh (1853-1890) the exceptionally gifted painter of the French postimpressionist movement and King Ludwig ll (1845-1886) of Bavaria popularly known as the Swan King, both of whom suffered premature violent deaths. They had led unhappy lives battling their internal demons and were in the end failed by the medical care they received. In both events the physicians entrusted with their care were distracted from their clinical responsibility by the celebrity of their patients with tragic consequences. About the Speaker: Rashid Jooma qualified in medicine from Dow Medical College in 1976 and trained for neurosurgery in the UK and USA. In 1984, he obtained the FRCS in Surgical Neurology before returning to Pakistan. In a career spanning over 30 years he has served at the Jinnah Postgraduate Medical Centre as head of department and executive director of the Centre as well as serving as Director General Health Services to the Federal Government at Islamabad. 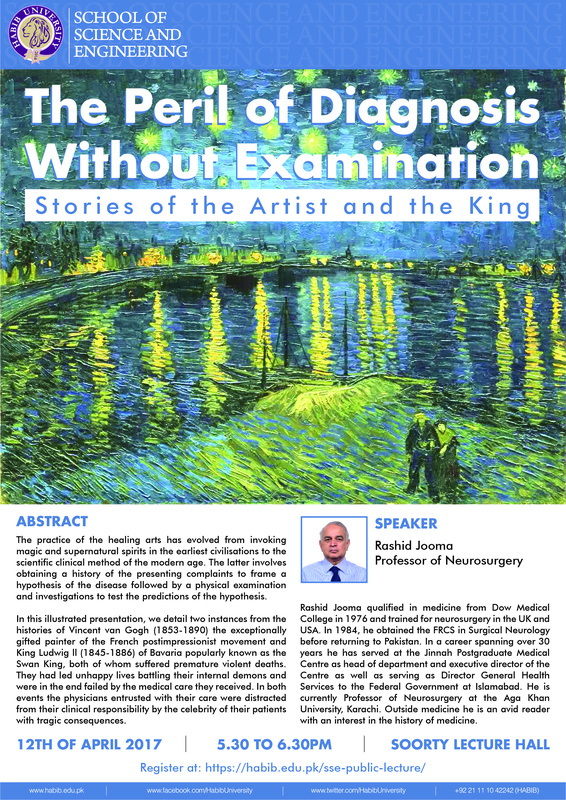 He is currently Professor of Neurosurgery at the Aga Khan University, Karachi. Outside medicine he is an avid reader with an interest in the history of medicine. About the talk: Biophysicists study biological macromolecules and their interactions to understand fundamental processes of life. Photo-biophysical investigations of light interaction with biomolecules allow a glimpse into how life “works” at molecular level. 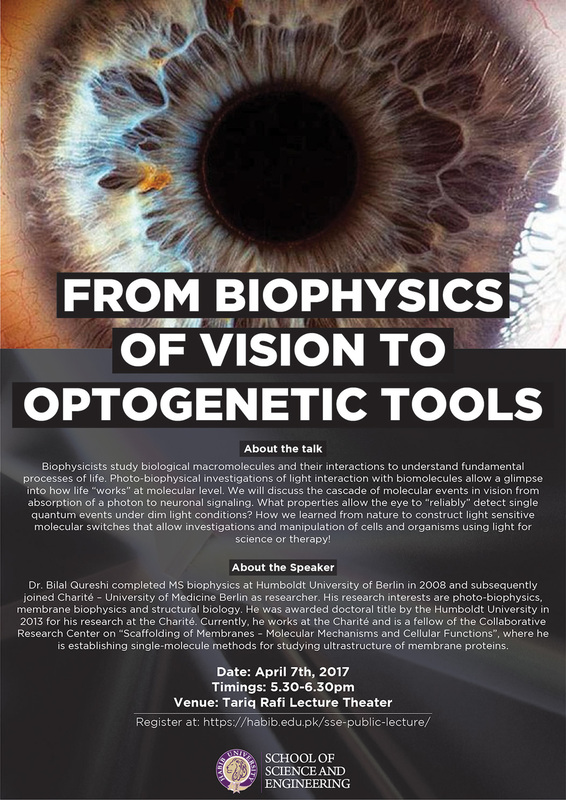 We will discuss the cascade of molecular events in vision from absorption of a photon to neuronal signaling. What properties allow the eye to “reliably” detect single quantum events under dim light conditions? How we learned from nature to construct light sensitive molecular switches that allow investigations and manipulation of cells and organisms using light for science or therapy! About the Speaker: Dr. Bilal Qureshi completed MS biophysics at Humboldt University of Berlin in 2008 and subsequently joined Charité – University of Medicine Berlin as researcher. His research interests are photo-biophysics, membrane biophysics and structural biology. He was awarded doctoral title by the Humboldt University in 2013 for his research at the Charité. Currently, he works at the Charité and is a fellow of the Collaborative Research Center on “Scaffolding of Membranes – Molecular Mechanisms and Cellular Functions”, where he is establishing single-molecule methods for studying ultrastructure of membrane proteins. About the talk: Particle Physics and cosmology have revolutionized humankind's understanding of the Universe and our place in it. 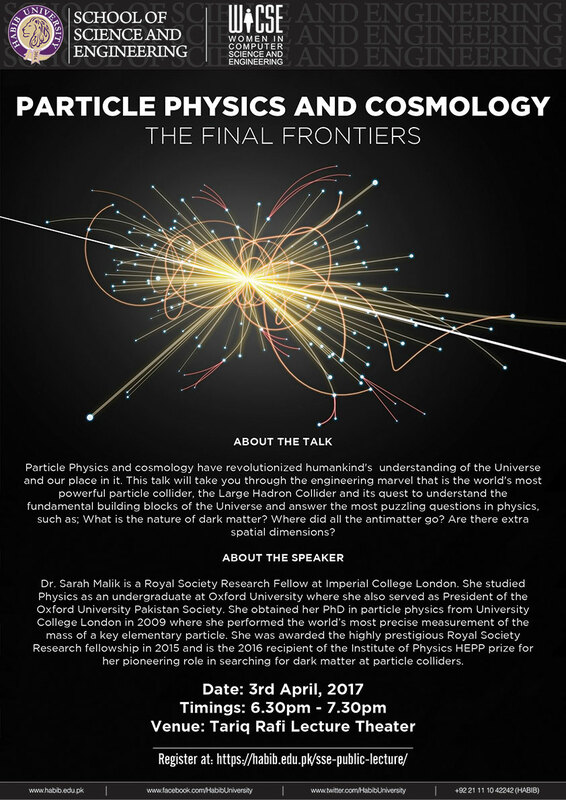 This talk will take you through the engineering marvel that is the world's most powerful particle collider, the Large Hadron Collider and its quest to understand the fundamental building blocks of the Universe and answer the most puzzling questions in physics, such as; What is the nature of dark matter? Where did all the antimatter go? Are there extra spatial dimensions? About the Speaker: Dr. Sarah Malik is a Royal Society Research Fellow at Imperial College London. She studied Physics as an undergraduate at Oxford University where she also served as President of the Oxford University Pakistan Society. She obtained her PhD in particle physics from University College London in 2009 where she performed the world’s most precise measurement of the mass of a key elementary particle. She was awarded the highly prestigious Royal Society Research fellowship in 2015 and is the 2016 recipient of the Institute of Physics HEPP prize for her pioneering role in searching for dark matter at particle colliders. 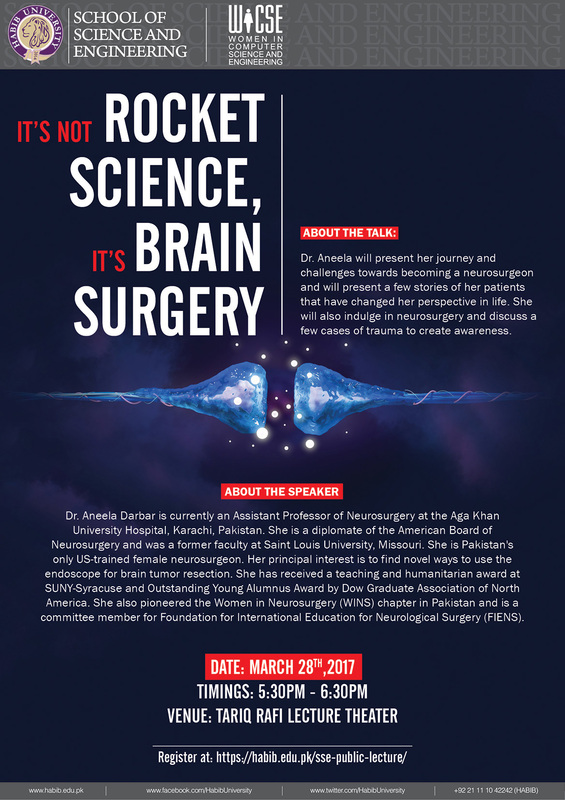 About the talk: Dr. Aneela will present her journey and challenges towards becoming a neurosurgeon and will present a few stories of her patients that have changed her perspective in life. She will also indulge in neurosurgery and discuss a few cases of trauma to create awareness. About the Speaker: Dr. Aneela Darbar is currently an Assistant Professor of Neurosurgery at the Aga Khan University Hospital, Karachi, Pakistan. She is a diplomate of the American Board of Neurosurgery and was a former faculty at Saint Louis University, Missouri. She is Pakistan's only US-trained female neurosurgeon. Her principal interest is to find novel ways to use the endoscope for brain tumor resection. She has received a teaching and humanitarian award at SUNY-Syracuse and Outstanding Young Alumnus Award by Dow Graduate Association of North America. She also pioneered the Women in Neurosurgery (WINS) chapter in Pakistan and is a committee member for Foundation for International Education for Neurological Surgery (FIENS). About the talk: A leadership talk by Sadaffe Abid, co-founder CIRCLE Pakistan, sharing key leadership lessons from her extensive experience of leading social change and incorporating Harvard's Adaptive Leadership framework. This talk will look at what it means to have an inclusive world and why it matters - inclusion boosts the bottom line! About the Speaker: Sadaffe Abid is co-founder and CEO at CIRCLE. Prior to this, she managed Kashf Foundation as CEO and COO, one of Forbes Top 50 microfinance institutions which she helped grow from a pilot in two rooms to serve 300,000 women clients in Pakistan. Sadaffe completed her Masters at the Harvard Kennedy School, Advanced Management Program at INSEAD and her B.A. at Mount Holyoke College. She is a recipient of the Mount Holyoke Alumni Achievement Award. Led by Sadaffe Abid, CIRCLE Pakistan’s mission is to advance women’s economic participation and empowerment through innovative entrepreneurship and leadership labs, advocacy campaigns and research. It strives to develop and support the entrepreneurial and leadership capacity of women and youth in Pakistan to bring about economic growth and social change. Abstract of the Talk: Historically, Art & Culture has always influenced social change, driven movements and inspired millions through its narratives and swaying opinions of its readers, listeners, and viewers. Many would even argue that art is central to social change, not peripheral. Simultaneously, technology is altering the world, from data sciences to artificial intelligence. While some are still amateur, others have indulged in the intersection of art, technology, and social change. The talk is centered around how we can contribute in this space, amplify each other’s strengths, and build a stronger, more robust, sustainable and scalable ecosystem, where Tech is the mind and Art its soul. About the Speaker: Imran Azhar is the founder & CEO of AzCorp Entertainment, a for-profit social enterprise, providing meaningful and entertaining storytelling with embedded civics, social justice and gender equality based themes. A hotelier by profession, a believer of technology and a geek by default, Imran has lived and worked in Middle East, Africa & Europe and now after 20 years, has moved back to Pakistan, creating content that prompt dialogue, instill critical thinking, evoke social consciousness and compel positive local action by its readers. Abstract of the Talk: This talk is more of a practitioner’s guide to Data Science and shows different facets of this complex, and sometimes mysterious, field. 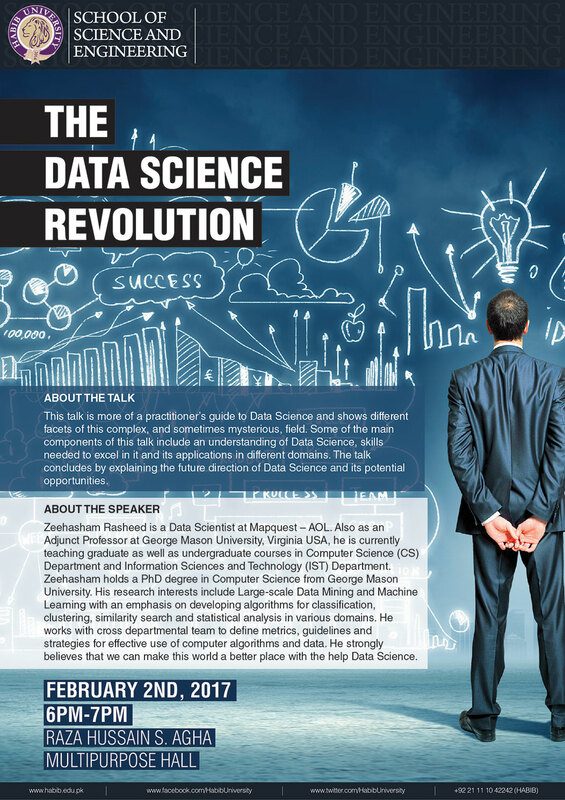 Some of the main components of this talk include an understanding of Data Science, skills needed to excel in it and its applications in different domains. The talk concludes by explaining the future direction of Data Science and its potential opportunities. About the Speaker: Zeehasham Rasheed is a Data Scientist at Mapquest – AOL. Also as an Adjunct Professor at George Mason University, Virginia USA, he is currently teaching graduate as well as undergraduate courses in the Computer Science (CS) Department and Information Sciences and Technology (IST) Department. Zeehasham holds a PhD degree in Computer Science from George Mason University. His research interests include Large-scale Data Mining and Machine Learning with an emphasis on developing algorithms for classification, clustering, similarity search and statistical analysis in various domains. He works with cross departmental teams to define metrics, guidelines and strategies for effective use of computer algorithms and data. He strongly believes that we can make this world a better place with the help of Data Science. Abstract of the Talk: Higgs boson is the corner stone of our current understanding of how the forces of nature work. 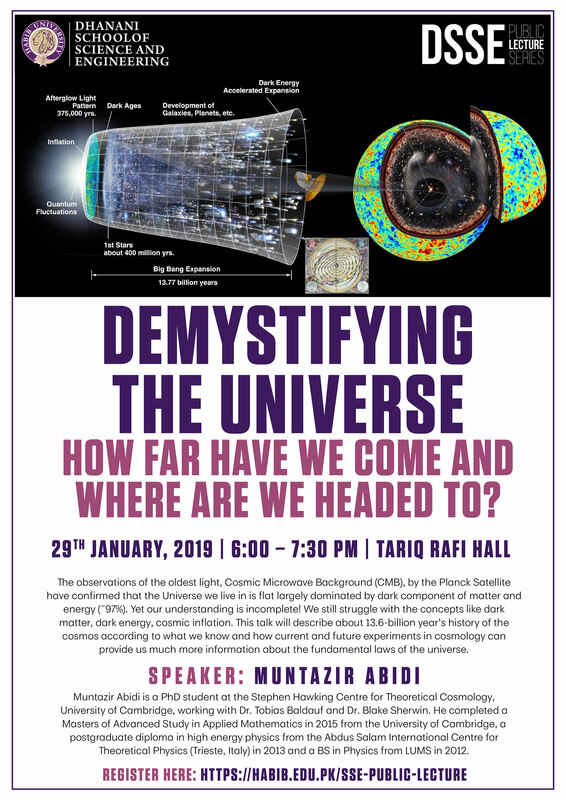 In this talk, aimed at general science audience, the main ideas behind the Higgs particle and its central role in Prof. Salam's underpinning of the whole particle physics via the standard model, will be described. The Higgs particle was one of the last predictions of Salam's theory, apart from the W's and the Z, and was found about three years ago at CERN. The prediction regarding the existence of Higgs boson relied on coming together of a host of ideas at the basis of physics and therefore its discovery has been hailed as one of the greatest triumphs of theoretical physics and is a testament to greatness of Salam's ideas in Physics. About the Speaker: Babar Ahmed Qureshi received his Masters in Physics from University of Punjab in 2002. That is also the year he started pursuing his Ph.D. in Theoretical Physics at Syracuse University, which he received in Dec. 2007. He then joined Dublin Institute for Advanced Studies as a Govt. of Ireland IRCSET Postdoctoral Fellow. He has also spent extended times as Visiting Scientist at Perimeter Institute, Kavli Institute for Theoretical Physics, CERN and UNAM in Mexcico. Abstract of the Talk: Rapid upgrades in consumer electronics, such as smart phones, at an ever increasing rate has created a stream of plastic waste that is difficult to dispose. This has driven research in sustainable fibre-reinforced bioplastics derived from renewable resources, known as “Green Composites”. Zain Zaidi will talk about the challenges involved in bringing green composites into everyday applications, and current methods that exist to counter these challenges. Polyhydroxybutyrate-co-valerate (PHBV) is a bioplastic derived from bacteria and offers much promise for a sustainable future. Zain Zaidi’s work will allow future researchers to study the effect of certain additives on the mechanical, thermal and biodegradation properties of PHBV. About the Speaker: Zain Zaidi is a PhD student at the School of Materials Science and Engineering, University of New South Wales (UNSW), Australia. His research interests include polymer science, composite materials science, biopolymers, natural fibres and natural rubber. Abstract:This talk will analyze the shared 12 tone scale, used in almost all musical traditions around the world, in terms of its frequencies and highlight some of the unique approaches to their treatment in South Asian music. The discussion will then graduate towards the modular arithmetic found in the world of rhythm in South Asian music with demonstrations of how those calculations manifest themselves in the unique poetry of the language of tabla. The speaker will be accompanied by young sitar prodigy Shehroze Hussain for the melodic demonstrations and the legendary Ustad Khursheed Hussain for the final tabla compositions. About the Speaker: Yousuf Kerai is a faculty of mathematics in the Integrated Sciences and Mathematics department of the School of Science and Engineering at Habib University. Simultaneously, Yousuf is an accomplished musician who has dedicated much of his time to helping young listeners engage with their South Asian musical inheritance. He directs an ensemble of master musicians of Pakistan called Tarz Group, reformulating the performance and presentation of South Asian music to be more appealing for the uninitiated listener. At Habib University, Yousuf will be formulating an elective course on Music and Mathematics for the next academic year. Abstract: This talk will introduce the concepts of creative thinking and innovation in conjunction with its utilization for problem solving. It will differentiate between everyday creativity and eminent creativity and it will highlight the necessary pre-requisites to harness one’s own creative power. We will look at the nature of problem solving, the need for out-of-the-box thinking, steps in the process, the use of both divergent and convergent thinking at each step, and how individuals demonstrate preferences for different parts of the process. The audience should leave the session convinced in their own power to be creative and eager to solve the next challenge they encounter! About the Speaker: Rumman Ahmad has a Masters in Creativity and Change Leadership from State University of New York and an MBA from IBA. He trains, teaches and facilitates groups of people to learn and apply the skill of creative problem solving. He also organizes an annual conference on innovation to spread the word far and wide. When he's not being creative for creativity's sake, he runs a luxury product import and distribution business – also creatively. About the Talk: While zillions of technological gadgets have bombarded our lives, various design-thinking approaches have emerged to study the users’ behaviors and interactions. Designers use these emerging techniques to acquire insight into the desires and needs of these gadget users. This talk aims to highlight such tools while discussing the boundaries and overlaps among empathic design, co-design, participatory design, and exploratory experimentation through the representation of various approaches to design thinking. About the Speaker: Muqeem Khan is an associate professor at Habib University. He holds a B.S. in interior design and an M.A. in industrial design from the Ohio State University. His motion picture credits with Walt Disney and Square USA include Deep Rising, George of the Jungle, Flubber, Armageddon, and Final Fantasy. He is currently researching digital intangible heritage for his Ph.D. at UNSW Art & Design, Australia. Besides teaching design classes at Virginia Commonwealth University and Northwestern University in Qatar, Khan has predominantly been teaching 2D/3D animation classes for over 12 years. Being Entrepreneur-Centric in Pakistan: What will it take to build Pakistan’s Entrepreneur-centric Eco-System? Join us in discussion with dynamic entrepreneurs, investors and innovators to hear their stories of building businesses and what needs to be done to make Pakistan a more robust and start-up enabling eco-system. 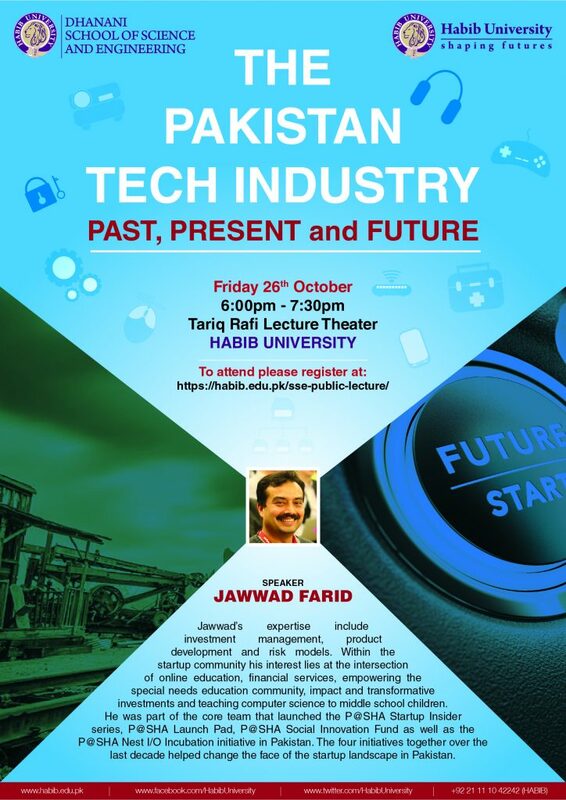 We will be joined by Jehan Ara Pasha (President Pakistan Software Houses Association for IT & ITES) and Fawzia Naqvi. - Start-ups will talk about what it means for them to operate in an entrepreneur-centric eco-system, the challenges that follow without a lack of support. -Fire side chat between Jehan Ara Pasha and Fawzia Naqvi. There is little doubt that Quantum Mechanics will reshape the face of the planet and humanity in the coming decades. As current hardware technology reaches its limit in exploiting Moore’s law, Quantum Computers are developing as the future of computation. But a real life Quantum Computer is far from replacing our current computers. Dr. Adam Zaman Chaudhry is currently serving as an Assistant Professor at the Department of Physics, Syed Babar Ali School of Science and Engineering, Lahore University of Management Sciences. His research interests include Atomic, Molecular and Optical Physics, Theoretical Physics, and Quantum Physics. He completed his PhD from National University of Singapore (NUS) in 2013 under supervision of Gong Jiangbin. The title of his PhD thesis is “Understanding and Controlling Open Quantum Dynamics”. After completing his PhD, he was post-doctoral researcher at NUS until August 2014. He is an active researcher publishing his research regularly in the area of quantum physics and related fields in high quality impact factor journals, such as Physical Review A (impact factor 2.765), Journal of Physics B (impact factor 1.833), and Canadian Journal of Chemistry (impact factor 1.061). This talk will examine surviving historical evidence on the use of the Abjad number system in the Muslim world. Its varied use has been responsible for the development of the hard sciences on the one hand, and the production of unique pieces of poetry and culture. It was a system that is today lost to us because of Modernity but known to most for centuries; many of the things the Modern use, stemmed from this system that the Orient gave to the world. Dr. Hasan Ali Khan is an Assistant Professor in the School of Arts, Humanities, and Social Sciences at Habib University, Karachi. His doctorate from the School of Oriental and African Studies (SOAS), University of London, is on the beliefs, history, and architecture of the Suhrawardi Sufi Order in Multan and Uch, 1200-1500. THE WAR AGAINST CANCER: CAN WE WIN? In 1971, the then U.S. President Richard Nixon declared “war” on cancer. Four and a half decades later, cancer is still one of the most feared human diseases around the globe. What is cancer? When did it become part of human history? Can we defeat it? This talk will de-mystify cancer. Dr Ghias will focus on the journey of a cell as it transforms from normal to cancerous and talk about what already exists and what is needed in our arsenal to fight the disease. Dr Kulsoom Ghias completed her PhD and post-doctoral training at Northwestern University’s Robert H. Lurie Comprehensive Cancer Center in Chicago, Illinois. She is currently faculty in the Department of Biological and Biomedical Sciences at the Aga Khan University Medical College in Karachi where she is involved in teaching in the undergraduate medical program and the graduate program, and in research on head and neck cancers and colorectal cancers. Today’s world is more interconnected than ever before. Yet for all its advantaged, increased connectivity also increases risk of theft, fraud and abuse. As we become more reliant on modern communication technologies, our vulnerability to cyber-attacks increases as well. Cyber security experts thus perform an essential role in ensuring cyber security objectives by investigating a wide range of cyber-crimes, from theft and fraud to cyber-terrorism. The objective of this talk is to share current cyber security challenges and threats for an internationally-renowned organization. Anjum Nazir has more than 10 years of experience in Computer Science System, Networks and Information Security training & consulting. Currently, he is working as a Senior Network Security Analyst in United Bank Limited (UBL), one of the largest private sector banks in Pakistan. LIGO observatory recently announced the first ever observation of Gravitational Waves (GW) thus confirming the most spectacular prediction of Einstein's General Theory of Relativity (GR) about 100 years after the theory was presented. Einstein imagined the empty space (and time) as a dynamical entity, much like a piece of foam, which can be bent, curved and stretched -- gravity being viewed as an effect of this curvature. The most dramatic prediction of this idea is the existence of gravitational waves: ripples in empty space itself. These are like tremors occurring in vacuum. In this talk, starting from simple notions, I will explain what does it mean to curve space and time, how it is related to gravity, what exactly are gravitational waves and how they are detected; all in a language that should be accessible to general public. I will also discuss why this discovery is so important and what new windows it opens in our understanding of the universe that we inhibit as well as technical marvels that were achieved in order to detect them. Prof. Babar Qureshi is a theoretical physicist who works on a broad range of theoretical ideas ranging from very basic fundamentals including quantum gravity, non-commutative geometry, string theory, non-perturbative aspects of quantum field theory to more applied ones including quantum computation using quantum Hall systems and properties of exotic materials such as topological insulators. He received his Ph.D. in theoretical physics from Syracuse University in Dec. 2007 and then worked as Govt. 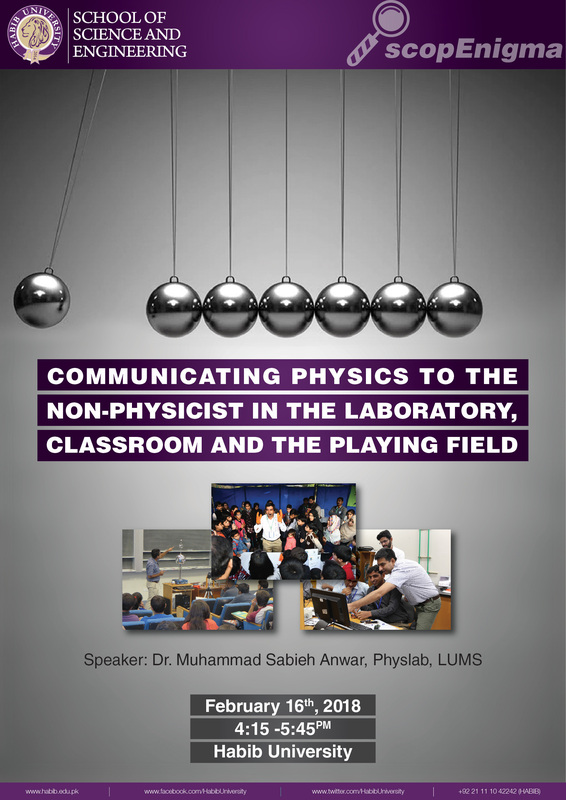 of Ireland IRCSET Postdoctoral Fellow before joining the Department of Physics at LUMS. He has also spend extended times as visiting scientist at Perimeter Institute, Kavli Institute for Theoretical Physics, CERN and UNAM. Provide opportunities to improve living standards for majority, enabling them to create wealth by the “trickle-up” effect. Shahid Khan will be talking about his organizational work in the area of sustainable development and his approach to establish neglected coastal communities in Pakistan through sustainable developments. He will be talking about the projects of Indus Earth Trust (IET) targeting the main underlying issues affecting these communities in six different areas such as the Livelihood Employment & Enterprise Development Program, and Livelihood Support Infrastructure, Water and Community Physical Infrastructure, Alternative Energy Solutions, Indigenous Housing Systems, Food Security and Drought Mitigation and Adaptation. Mr. Shahid Khan will also explore the opportunities working with the HU Community to tackle these program areas to uplift and benefit communities in a holistic manner. Shahid Sayeed Khan is the CEO of Indus Earth Trust (IET). He established IET, with the vision of helping the underprivileged build better lives. Qualified as an Environmental Architect in the UK, he pursued private practice in Scotland for 18 years. Shahid further studied building techniques in France (CRATerre) and Japan (Tokyo University). He has been a consultant to the World Bank on projects in Afghanistan-Renewable Energies, Ethiopia-Water/land management, and Yemen-Livelihood Options. He has over 40 years of experience in Architecture and Rural Development. He has been working in Pakistan since the early 1990s. This presentation is about human curiosity and its journey from computer-generated imagery to trans-disciplinary design approaches. 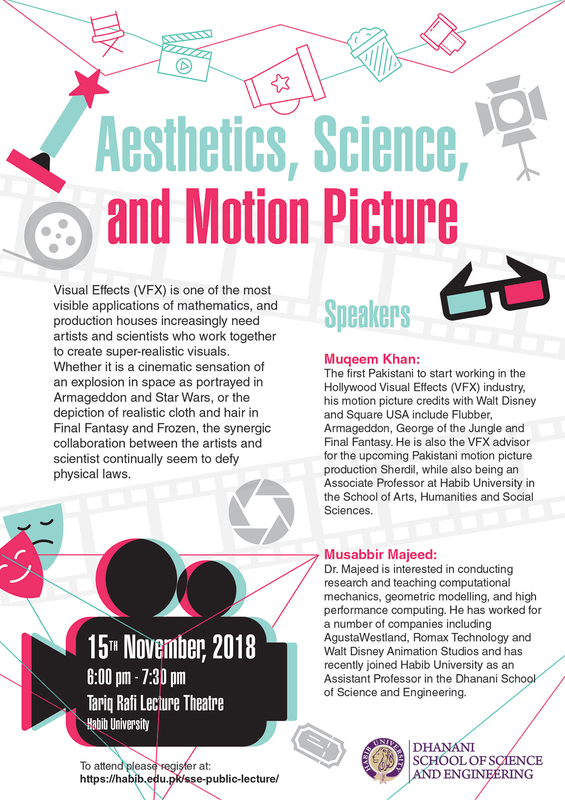 Join Muqeem Khan and experience his memories of creating motion picture realism and his current Ph.D. research in combining design thinking, intangible cultural heritage and emerging interactive technologies. The presentation will also feature stereoscopic 2D animations generated by Habib University students. Muqeem Khan holds a B.S. in Interior Design and an M.A. in Industrial Design from the Ohio State University. His motion picture credits with Walt Disney and Square USA include Deep Rising, George of the Jungle, Flubber, Armageddon and Final Fantasy. Through ‘empathic design’ and associated techniques, he is currently researching Digital Intangible Heritage for his Ph.D. from UNSW Arts & Design, University of New South Wales, Australia. He is focusing on the continuity of cultural knowledge by proposing a new model for access to indigenous methodologies, particularly non-codified or traditional knowledge. Specifically, he is investigating, documenting and transmitting the Unani medicinal practices in Pakistan. Besides teaching design classes at Virginia Commonwealth University and Northwestern University in Qatar, Khan has predominantly been teaching 2D/3D animation classes for over 12 years in the Arabian Gulf region. He is currently an associate professor at Habib University. RoboCup Soccer is amongst the most challenging yet exciting competitions within the field of Computer Science in which teams of autonomous robots play soccer. The competition has a stated goal that “by the mid of 21st century, a team of fully autonomous robots would defeat humans in soccer. The competition provides an excellent platform to conduct research in different areas of Artificial Intelligence and Cognitive Robotics. KarachiKoalas is a RoboCup Soccer Simulation 3D team developed at Artificial Intelligence lab, IBA. The project was started in 2011 and, in just couple of years, the team managed to get 5th position in RoboCup 2013. In this talk, Dr. Saleha will talk about this exciting journey of KarachiKoalas. Dr. Saleha Raza is Assistant Professor at Habib University. She completed her PhD from IBA, Karachi where she was an active member of their Artificial Intelligence lab. She has been the technical lead of KarachiKoalas and has participated in RoboCup from 2011 – 2013. This talk will be comprises of modern ways of doing Hardware and Software design by using Virtual Prototypes which not only helps reduce Time-To-Market (TTM) of products but also helps in catching bugs in early stage of design. In first half of the talk, comparison between traditional methodology vs Virtual Prototypes will be discussed and advantages of Virtual Prototypes for both Hardware and Software design. Methodology involved in Virtual Prototypes which consists of SystemC and TLM Modeling will be discussed in second half and also difference between Virtual Prototypes for Hardware Design and Software Design. Saad has done B.E (Electronics) from NED University of Engineering and Technology. After completing his engineering he went to Germany for higher studies and got his M.Sc. in Communication Engineering from Technical University of Munich (TUM), Germany. His M.Sc. thesis was Design Space Exploration for Multiprocessor Architecture using Virtual Prototypes. For more than 3 years he is working in Intel Germany as Virtual Prototyping Engineer. Engineers build problem solutions. That is the focal point for all engineering education. As educators, we have to communicate the romantic idea of creating something from nothing. At the beginning of each and every engineering project there is an idea of building something useful. The challenge is to turn that idea into a working problem solution. We at Habib University aim to overcome that problem with systems engineering. To be specific, we follow the systems engineering methodology by asking and subsequently answering the following questions: Why do we need the system? What system should we build? How do we build the system? The presentation will focus on answering these questions for three independent staff and student projects. We have created physical problem solutions for remote motor control, signal conversion and robot teleoperation. While going through the individual design steps, we learned that having a powerful design methodology helped us to focus our energy to create novel problem solutions. That understanding helped us to adjust and indeed create innovative learning modules for Habib University students. Dr. Oliver Faust has been actively involved in science, research and higher education since 2001. He has served various academic and private institutions, where he improved academic standards and pushed the boundaries of science to come up with innovative solutions to physical problems. Dr. Faust has joined Habib University after spending four years at Ngee Ann Polytechnic in Singapore. Dr. Faust’s research interests include formal and model-driven biomedical systems design, parallel systems, digital communications, and nonlinear and cognitive signal processing. He has published more than 50 papers in peer-reviewed journals and international conferences. Dr. Faust has also been the Principal Investigator for the multi-standard radio system project. With the coming of the Age of Enlightenment natural scientists were suddenly offered new tools for exploring and understanding the world around them. Many turned these tools towards describing a scientific principle or mechanism that could explain the Great Flood described in the Bible, shared by the Islamic world as the Toofan-e-Nooh. Read from the contemporary perspective, many of these explanations can only be described as ‘fanciful,’ but recent geological research using data gleaned from the USArray suggests that one of these explanations, proposed in 1681 by Thomas Burnet, just might hold water after all. This talk will explore some of these Enlightenment era theories and connect them to contemporary research, and in so doing underscore the deep connections between the natural and social sciences. Is Human Intelligence Physical ? In this talk, Dr. Rashid will identify and review some of the assumptions behind Roger Penrose's prrof regarding simulating human intelligence. Dr. Jibran Rashid is currently an Assistant Professor of Computer Science at the School of Science & Engineering, Habib University. His current research interests include quantum information and computation, theoretical computer science and educational technologies. Can Human Intelligence Be Simulated? Venue: Tariq Rafi Hall, Habib University. The question “Can machine think?” has shadowed computer science from its beginnings. Computers are becoming more powerful at an ever-increasing rate, but will they ever become conscious? Despite the ongoing success of applied Artificial Intelligence, the claims of Strong AI to duplicate human intelligence remains controversial. In this talk, Ahmed Raza will talk about the impossibility of simulating human intelligence and will elaborate mathematico-physical arguments to counter the claims of Strong AI. His talk will highlight the arguments and themes developed by the great English mathematical physicist and philosopher of science, Sir Roger Penrose against the proponents of Strong AI. About the speaker: Prof. Ahmed Raza has a Masters and Mathematical Tripos from King’s College, Cambridge. He currently teaches at IBA, Karachi and has previous taught at McGill University, LUMS and other universities. In traditional software, the meaning of data highly depends on the implementation (of the software). In general, every implementation interprets data independently from other implementations. Hence, machine-interoperability is impractical if not impossible. Semantic technologies answer the aforementioned problem by encoding semantics (meanings) separately from data and implementations. In this talk, we provide a brief introduction to semantic technologies. We mainly focus on the area from Semantic Web perspective. After discussing some foundational concepts, we describe few important formalisms behind the technologies. Finally, we discuss some possible application areas. About the speaker: Dr. Anees ul Mehdi has a PhD in ‘Epistemic Reasoning’ from the Karlsruhe Institute of Technology (KIT), Germany. He is an expert in Knowledge Representation, Computational Logic, and Ontologies. Everyone loves to play games irrespective of gender & age. Games are addictive, games are fun and most importantly, games are a medium of artistic expression. Gaming industry has become bigger than Hollywood in recent past and more and more people wants to involved in games one way or the other. There is however one big hurdle that stops most people in their tracks and that being, they do not know where to begin. Even if they do begin at some point they make some critical mistakes that kills their ambition and demotivates them. This talk aims to provide you with the basics that may help you in doing game programming, avoiding the fatal mistakes and give an overview of the most effective tools you can use to make a successful game in no time. This talk focuses on an often overlooked aspect of successful innovation – the ability to prototype the entire entrepreneurship model from conception to finished products. Prototyping for entrepreneurship involves running the same tests and market research on hardware as it does for software and documentation. A properly executed ‘storyboard’ for the entrepreneurship model results in savings in cost, time and resources and allows a safety valve for alternative strategies to be developed before actually committing to market or production. Protein engineering is one of the most powerful and remarkable developments in biotechnology; has been used over decades to manipulate amino acid sequence at gene level leading to novel protein with desired functions. Construction of gene at will in order to produce new protein structure is no longer dream due to the advancements in the field of genetic engineering. This exciting area of research has enormous commercial applications with huge impact on industry ranging from drug designing to stem cell research, bio engineering, chemical industry, environment, food and agriculture. Protein engineering is relatively new field gaining lots of attention, has had major breakthrough in medical science with the production of insulin; may play vital role in nearly every field in future. The primary aim of my talk is to give students and other audience an overview of genetic modification and their applications in biotechnology. This talk essentially provides a basic understanding and insight in the prevailing approaches and strategies used in protein engineering in order to generate efficient and novel protein with improved functionality. Mathematics and art have a long historical relationship. The ancient Egyptians and ancient Greeks knew about the golden ratio and regarded as an aesthetically pleasing ratio. They may have incorporated it and also some other mathematical relationships into the design of monuments including the Great Pyramid, the Parthenon and the Coliseum. This scientific influence can be traced in works of architects, artists, and designers who have been inspired by mathematics and studied mathematics as a means of complementing their works. This public lecture will be devoted to mathematical notion of the divine proportion and its appearance and applications in nature, science, art, design and architecture. The Coolest Side of Physics. Where is the coldest spot in our solar system? Are the fundamental constants of physics changing with time? What happens to physics if we reverse the direction of time, or if we replace matter with antimatter? Can you catch atoms and molecules? The study of atoms and molecules has fascinated humans since Democritus. Experimental physics of the 20th century has had an especially fruitful journey into the atomic world. From Rutherford’s experiment to the advent of quantum mechanics, from ionizing atoms to the discovery of a new type of chemical bonding, from the invention of the laser to the creation of Bose-Einstein condensates, experimental physicists have pushed the envelope on how precisely they can control atoms and molecules and measure their properties. In this talk, I’ll present an overview of the field of experimental atomic and molecular physics, and argue why it's indisputably, the coolest part of physics." Learn more about Habib University’s degree programs directly from the faculty engaged in developing and teaching. Attendees will have the opportunity to understand Habib University’s approach to liberal arts and sciences and its unique pedagogy. The ability to use computers to solve problems is hailed as the "new literacy". This ability rests on a particular approach to computation and to problem solving which is generally termed as “Computational Thinking”. Not surprisingly, Computational Thinking finds useful application in a wide variety of domains. This talk showcases some of the work of the students from Habib University’s first semester course on Computational Thinking. The first half of the talk presents joint projects with design students. And the second presents an effort to automatically compute the derivative of a given mathematical expression. I would talk about the philosophical origins of this principle that gave a new and unifying outlook to Physics. The idea permeates even the cutting edge theories of the contemporary Physics. To quote Feyman, "One day my Physics teacher called me down and said, 'You look bored; I want to tell you something very interesting.' Then he told me the principle of least action. The talk is closed now! © Habib University, All rights reserved.